The American Poolplayers Association (APA) was founded by professional poolplayers Terry Bell and Larry Hubbart in 1979 as the National Pool League, which became the American Poolplayers Association in 1981. The two realized the popularity of the sport, but knew that, different from other sports, there was no existing recreational league system. Today, the APA, also known as the Canadian Poolplayers Association in Canada and the Japanese Poolplayers Association in Japan, has grown to more than 260,000 members and boasts more members than all other “national” leagues combined. The League is administered locally by a network of Franchise Operators. League play is conducted weekly with both 8-Ball and 9-Ball team formats offered. The APA has been our ongoing client for over a year now. We are doing multiple projects for them and fast becoming there exclusive web design firm. 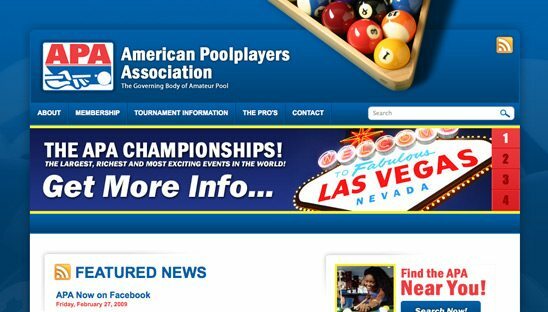 This project was do re design the poolplayers website for both the APA and CPA. Pool Players site is for everyone to find out about the leagues and memberships.